Ramachandra, or Lord Rama, is one of the Supreme Person's many avatars on earth. He appeared during a previous age, Treta-yuga, and ruled as emperor of the world. A chronicle of His activities is presented extensively in the epic Ramayana, and concisely in the ninth canto of the Srimad-Bhagavatam, a biography of Krishna's many incarnations. Ramachandra's life is considered to be exemplary in every way. Followers of India's Vedic culture see Him as the ideal king, the most powerful warrior, and the most faithful husband. It is said that He ruled His kingdom just as a loving father cares for his children. Lord Rama's nobility, integrity, decency, and virtue are spoken of with reverence even today. He appeared as the eldest son of Maharaja Dasarath, along with brothers Bharata, Lakshmana, and Shatrughna—also incarnations of the Supreme Person. He married Sita devi, daughter of King Janaka, after breaking the bow of Siva in the contest for Sita's hand. On the day of Ramachandra's coronation, however, due to royal intrigue, He was banished to the forest for fourteen years, and Lakshmana and Sita accompanied Him there. Ravana, king of Lanka, kidnapped Sita when Rama was absent from Their forest home. Subsequently, Rama and Lakshmana organized an army of forest-dwelling simians, vanaras—including the great devotee Hanuman— to attack Lanka. He then killed Ravana, rescued Sita, and triumphantly returned to His capital city, Ayodhya. 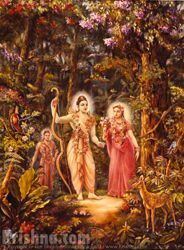 Image shows Laksmana, Rama, and Sita in the forest during Their exile from Ayodhya. - setting the standard for heroism, morality, virtue, and good government. - where Lord Rama met the sage Agastya Muni and received weapons and benedictions which He used in His fight with Ravana. - the Srimad-Bhagavatam's description of Ramachandra's activities. - Ramachandra's most prominent devotee, who appeared in a race of human-like forest-dwelling simians. "Due to His causeless mercy upon all living entities within the universe, the Supreme Personality of Godhead [Ramachandra], along with His plenary extensions, appeared in the family of Maharaja Iksvaku as the Lord of His internal potency, Sita. Under the order of His father, Maharaja Dasaratha, He entered the forest and lived there for considerable years with His wife and younger brother. Ravana, who was very materially powerful, with ten heads on his shoulders, committed a great offense against Him and was thus ultimately vanquished." The historical context, appearance, and activities of Ramachandra. "The Supreme Personality of Godhead incarnated Himself as Sri Rama, accepting the sonhood of His pure devotee Maharaja Dasaratha, the King of Ayodhya. Lord Rama descended along with His plenary portions, and all of them appeared as His younger brothers. In the month of Caitra on the ninth day of the growing moon in the Treta-yuga, the Lord appeared, as usual, to establish the principles of religion and to annihilate the disturbing elements." "Lord Rama was so saintly that people even now are anxious to live in the kingdom of Lord Rama (rama-rajya), but Lord Rama never showed any cowardice. Ravana was an aggressor against Rama because Ravana kidnapped Rama's wife, Sita, but Lord Rama gave him sufficient lessons, unparalleled in the history of the world." "The residence of Lord Ramacandra on this planet is Ayodhya. Ayodhya City is still existing in the district of Faizabad, which is situated on the northern side of Uttar Pradesh." Is Rama different from Krishna?